A great night with before 2416 fans at Kingston Heath, Friday 5th of October. 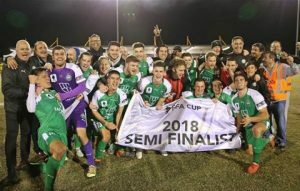 Even though the Greens lost 0-2 against a well drilled A-League opponent, they still made history – the only non A-League team to make it twice to an FFA Cup Semi Final since the FFA Cup began in 2014. It was clear how much the senior squad wanted this in the home change room after the game. I have never observed such an emotional finish to a season in the 32 year history of the Greens. When the opponent is an A-League team in October and match ready, there is another step up in professionalism required. Nevertheless the Greens capped off a great season, runners up in the league and winners of the Dockerty Cup 2018 – The most well known Non A-league brand in the land.